We all enjoy hookah and talking about different gear and flavors. Most of the times, we forget how important the selection of charcoals is in hookah preparing process. Even if you have the best gear and flavors but fail to provide the best charcoals in the market, your hookah would not be as satisfying as it might be. Today we are going to discuss the difference between different types of hookah charcoals and there best use (Quick light, Natural wood, Coconut shell charcoals). Ever since the industry started to emerge there was vast majority of different brands of charcoals. Today this diversity of charcoals only expanded and reached a point where you can get 1 brand of charcoals and see several lines of charcoals inside of the brand. First option that a lot of people is familiar with is quick light charcoals. The benefit of these charcoals is that it does not require heating up the charcoals for extensive amount of time. These charcoals have special coating which allows the charcoal to light up in no time. Another benefit of these charcoals is that it only requires 1 short exposure to the open source of flame. Benefits, however, stop there. Everything else that is about these charcoals is underwhelming at best. Everyone who’s ever tried these charcoals would say that they give an awful smell, they cause headache in most instances, and the heat output from these charcoals is lacking. Due to the coating that quick light charcoals have, the smell that they produce is something not a lot of people would be willing to tolerate. It feels like these charcoals were produced for 1 purpose, to avoid them. So if you ran out of charcoals and quick light charcoals is the only option your smoke shop has at the moment, you are in no luck as you want to avoid these charcoals at any cost. Another popular option that has a right to exist is natural wood charcoals. These charcoals have to be from lemon tree but not the regular charcoals that you would put on the grill. Lemon tree charcoals are popular option in Middle Eastern countries as it was used historically to enjoy hookah back in the days. This option is 100s and 1000s times better than quick light charcoals. Try them out and you will not be disappointed. The only downside of the lemon tree charcoals is their tendency to leave a lot of ash. This ash blocks the heat that the charcoal produces. This option would work best with foil and mellow flavors, but regular HMDs would not work best with these charcoals as the heat production would not be enough to provide a good hookah session. The last on the list are the coconut shell charcoals. A lot of hookah lovers enjoy these charcoals at home, at the lounges, and it is their first option when choosing charcoals. Coconut shell charcoals are made from coconut. So no tree is cut to produce these charcoals. Their heat output is superb and the ash is minimal from these charcoals. Due to the high heat output it is the option that a lot of people enjoy. On top of this, they last longer than any of the previously mentioned options. Currently there are 100s of different brands that sell coconut shell charcoals. They are all good but keep an eye on their sizes. Some are 22mm, others are 25mm, and there are a lot of brands that push bigger size of charcoals these days. We found 25mm to work the best with HMDs and that is what we are using at our lounge. If you are still unclear on what is the best option of charcoals, do not hesitate to stop by our lounge to try the coconut shell charcoals. 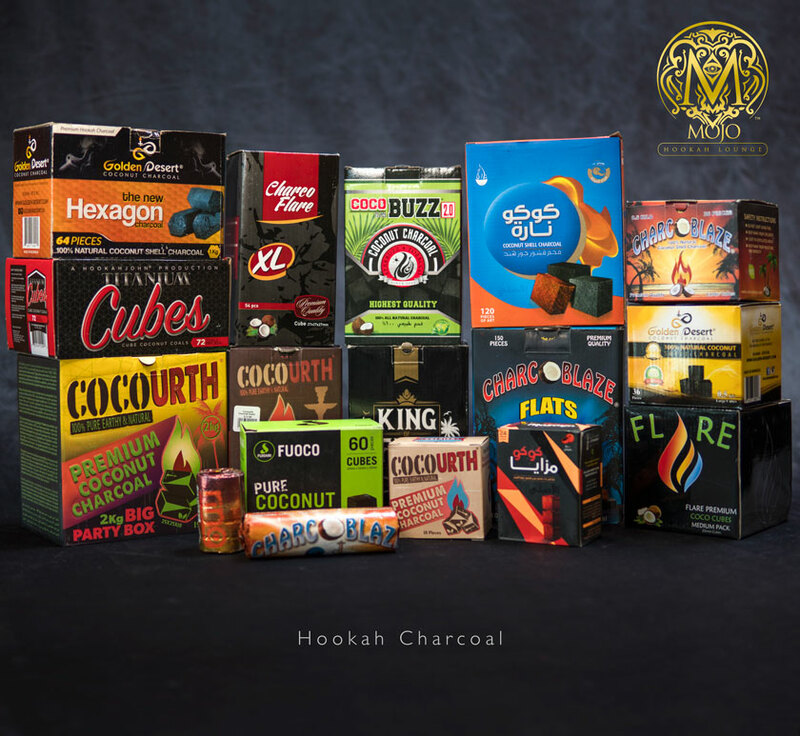 You can ask any of our hookah masters for an advice on charcoals and we will be able to assist you with the choice. Always remember to enjoy hookah responsibly and stay away from improper gear while enjoying the hookah!